As the internet makes people feel free to express ever more extreme opinions about each other, extreme ways might be needed to police their behaviour. 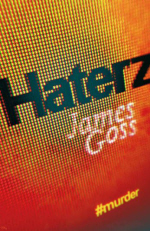 The solution in James Goss' comedy-thriller Haterz takes no prisoners - the narrator is a serial killer targeting trolls and anyone else who makes the internet a worse place. He starts more or less by accident, slipping peanuts to the allergic girlfriend of his friend, who uses Facebook to passive-aggressively make people's lives a misery. But it catches the attention of a mysterious conspiracy he calls The Killuminati, who finance him to get rid of trolls who threaten violence to random women, charity scammers and teenage pop fans who try to bully others into suicide. I really enjoyed Haterz, which doesn't stick just to black comedy but also sees the narrator get more subtle in his revenge on characters who bear a certain resemblance to real people: A self-pitying columnist who lives in the country, slagging off her neighbours and ex-husband in her articles, gets her comeuppance when he turns her into a nice person, thereby ruining her career. It does look for a while as if the story's impetus is running out, but Goss salvages it with a couple of twists about who's been behind his mysterious funders.